Server vendors recorded the strongest shipment growth in over four years for the first quarter, mainly driven by continued investments in the hyperscale server infrastructures that power public and private clouds. It was a great start to the year, with the largest shipment growth since the third quarter of 2010, when the market was recovering from the economic downturn. First-quarter server shipments grew by 13 percent year on year to 2.7 million units, while revenue grew by almost 18 percent to US$13.4 billion, Gartner said on Thursday. This growth was driven by particularly strong demand from the so-called hyperscale area in the U.S. Hyperscale is a term used to describe distributed systems that use thousands of servers to power cloud and big data infrastructures, according to Gartner. Growth came from all form factors, including rack-optimized, blade, density-optimized, and tower servers, according to IDC, which reported similar server numbers on Thursday. Consolidation and virtualization in the enterprise boosted server vendors' revenue, IDC said. Hewlett-Packard and Dell were the number one and number two vendors in revenue and volume. 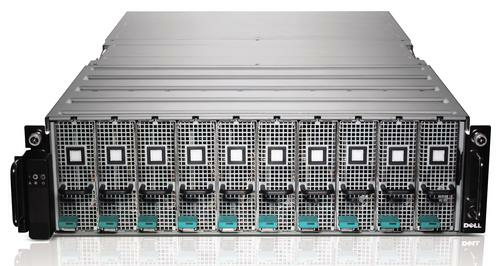 HP's revenue grew thanks to strong demand for its rack-optimized servers. Meanwhile, the company's density-optimized server business, while small overall, experienced triple-digit revenue growth year over year, IDC said. But even though its revenue grew, HP wasn't able keep up with its competitors. The company's revenue share dropped from 25.5 percent to 23.8 percent, while its market share by volume dropped 2.6 percentage points to 20 percent, according to Gartner. HP said last week that it is on track to divide itself into two companies later this year, one selling enterprise equipment and services and the other PCs and printers. Dell increased revenue and shipments, but it too wasn't quite able to keep up with the market. Its share of revenue and shipments each slipped by just under 1 percentage point to 17.1 percent and 19 percent respectively, according to Gartner. Dell also saw revenue growth in rack-optimized products and density-optimized servers -- where its revenue was the largest of any of the top five vendors, according to IDC. While HP and Dell led the market by both revenue and shipments, product mix led to some differences between the rest of the top five rankings by revenue and shipments. IBM had the third-largest server revenue, followed by Lenovo and Cisco Systems, while Lenovo was third by server shipments, ahead of Huawei Technologies and Inspur Electronics. Lenovo's and IBM's numbers were affected by Lenovo's acquisition of IBM's x86 server business. IBM has kept its mainframe business. Its refresh of the z13 in January, its first new mainframe in almost three years, helped bolster its revenue, according to IDC. Cisco's year-over-year server revenue growth of 44.4 percent was well above average for the industry, and suggests the company is not done capturing incremental market share in the server market, according to IDC. Cisco's blade business also continued to grow, with the company getting more revenue from blade servers than any other single company besides HP.